We’ve all seen it happen. . . We’re driving toward our destination, eyes on the road, when we notice a car in the lane next to ours start to drift slowly toward us. We adjust our own vehicle, then gradually slow down to allow for the erratic driver’s apparent need for access to both lanes. Then, through the other car’s rear window, we find out why it was unable to maintain its own lane: its driver was chatting away or attempting to text, rather than focusing on the task of driving. But how many of us have used such a close call to adjust our own behavior toward distractions in the car? Are we doing enough to spread the word about the danger distractions pose? And how can we do it more effectively? Eyes, hands, and mind on the road! Despite different methodologies, there is basic scientific agreement that cognitive distraction can degrade driving performance. Everybody understands that looking away or fiddling with gadgets increases risk – the problem is getting people to understand that even hands-free devices add driving risk too. It’s worse than we thought – about four times worse. When we look at studies of distraction among teen drivers, we’re finding out that the national statistics attempting to show the prevalence of distraction is actually underreporting it by a factor of four. (Temporarily) exiling digital natives. We need to train our children to make safe decisions, and to learn self-control so that the underlying behavior itself is changed. Technology can solve many problems with distraction, but consistently safe behavior remains critical. Can safety sell in the state house? Many state legislators admit that voting to ban the use of personal electronic devices in private vehicles is such a political hot potato that they won’t do it, even when they recognize the associated safety risk. As National Distracted Driving Awareness Month comes to an end this week, we have to ask ourselves – has anything changed? Incredibly, four states still permit texting and driving. Only 14 states and DC have laws prohibiting handheld cell phones while driving. The political will to pass effective laws banning distracting technologies from our vehicles is still lacking, evidenced by the fact that no state has yet taken the step to prohibit all PED use while driving. And, remember that car with the distracted driver creeping into your lane? Because they know the law does not punish their distracted driving with a penalty, they might continue their dangerous behavior until they – or you – pay a much higher price. Legislators may not have the resolve to end distracted driving, but you can chose to end distracted driving. Make the personal choice: don’t be a distracted driver, and don’t tolerate distracted driving by your children or friends. This blog also appears on the National Safety Council (NSC) website. NSC has received permission from the NTSB to reproduce it on the website. Importantly, seat belts, child safety seats, and air bags came into use. Changes also were made to enable other parts of the vehicle to be more “forgiving” for occupants in a crash thanks to the installation of a wide range of technologies—shatter-resistant windshields, energy absorbent steering wheels, and head restraints—that reduced lacerations and blunt force trauma, especially to the head, neck, and torso areas. Increased roof strength, as well as front and side protection also improved the crashworthiness of a vehicle in different types of scenarios, reducing the severity of injuries to drivers and passengers. Since the mid-1990s, the NTSB has recognized the significant benefit of technology countermeasures to prevent and mitigate motor vehicle crashes. Last year, the NTSB released a new report focusing on forward collision avoidance systems (CAS), which typically consist of warning to drivers of an impending crash, and autonomous emergency braking that automatically applies brakes. In 2012 alone, more than 1.7 million rear-end crashes occurred on our nation’s highways, resulting in more than 1,700 fatalities and 500,000 more injuries. As part of the study, the NTSB issued a Safety Alert entitled Addressing Deadly Rear-End Crashes for consumers and commercial fleet owners. Collision avoidance technologies—such as forward CAS, lane departure warning and blind spot detection—could help to mitigate or even prevent many such crashes; they are passive technology “vaccines” against the risk of motor vehicle crashes. New car assessment programs (NCAPs) around the world, such as the U.S.-based NHTSA NCAP and the Insurance Institute for Highway Safety, are part of Global NCAP and work to test vehicle crashworthiness in order to determine the safety of cars for the consumer. As technologies are introduced into vehicles, it is important that we do all we can to educate consumers on their life-saving benefits and how to use them. In addition, education campaigns like MyCarDoesWhat.org help to bring awareness to consumers as well. This blog also appears on the MyCarDoesWhat website. MyCarDoesWhat has received permission from the NTSB to reproduce it on the MyCarDoesWhat website. This permission does not constitute an endorsement of MyCarDoesWhat by the NTSB. 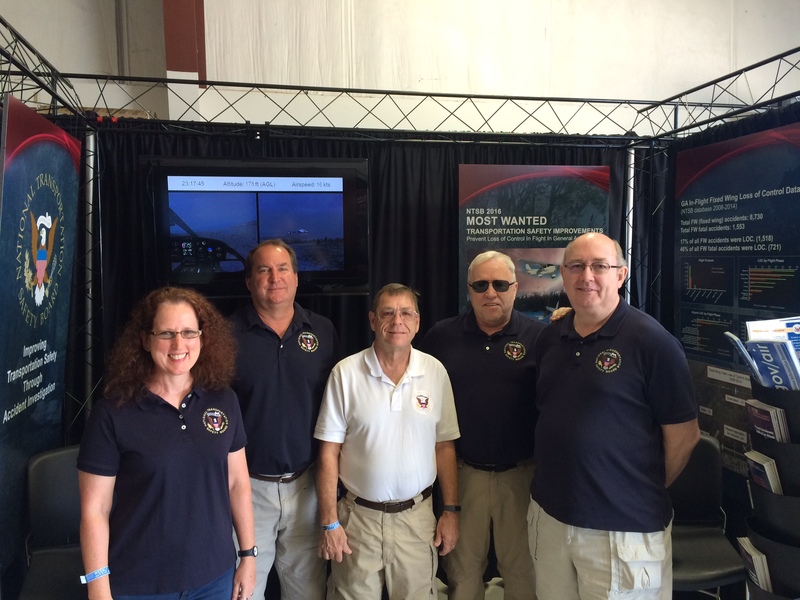 NTSB staff Christy Spangler (far left), Dan Boggs, Jeff Kennedy, Jim, Silliman, and Scott Dunham at Sun ‘n Fun. Aviation enthusiasts and pilots have gathered every year since 1974 for the annual Sun ‘n Fun International Fly-in and Expo. This extraordinary experience features many events of interest to the general aviation community and is attended by thousands of people. Last week the National Transportation Safety Board again brought its message of safe flying and accident prevention to the general aviation community and Sun ‘n Fun attendees. Aviation safety investigators discussed a variety of safety issues one-on-one with the hundreds, perhaps thousands, of visitors to the NTSB exhibit booth during the six-day expo. The booth featured video vignettes of aviation accident investigations, safety alerts, brochures on general aviation safety, the 2016 Most Wanted List, and the new ntsb.gov/air brochure, “A Guide to NTSB Aviation Information Resources.” NTSB employees at the booth helped visitors access the NTSB’s online investigative products including NTSB reports, accident dockets, and animations. In advance of this year’s annual fly-ins, the NTSB issued a new Safety Alert (SA-053), Arriving at a Fly-in Event, Keep Your Focus on Safety. This safety alert was intended to directly engage general aviation pilots who fly-in to events such as Sun‘n Fun and the Experimental Aircraft Association’s (EAA) AirVenture, the largest convergence of pilots in the U.S. The NTSB believed the safety alert was merited as the agency has seen several crashes at fly-ins as pilots are exposed to the unique challenges associated with these events, including high-density traffic, special flight and communication procedures, a rapidly changing environment, and changes to air traffic control separation standards. NTSB Board Member Earl Weener and air safety investigators also gave presentations on pilot reports, amateur‐built aircraft construction errors, flying into large airshows, and inflight loss of control prevention (an issue on the 2016 Most Wanted List). The hour-long presentations, which included Q&A sessions, were held at the Sun ‘n Fun FAA Safety Center and at the Central Florida Aerospace Academy, a charter high school. The considerable gathering of aviators at events like Sun ‘n Fun and the upcoming Air Venture present an excellent opportunity for the NTSB to engage pilots and convey important safety information. Training, technology, and situational awareness are all factors that can improve safety in general aviation. Safety is the NTSB’s focus – and should be a focus for all in aviation. Spring marks the start of road construction season. It is a time when motorists face lane closures, speed reductions, and road workers and equipment operating close to moving traffic. If drivers are inattentive road work can result in crashes that kill or injure road workers and motorists. National Work Zone Awareness Week is April 11-15 —a time to recognize the hazards of traveling in and around work zones. The NTSB has a long history of promoting work zone safety. I recall the agency conducting a safety study in 1988, involving the investigation of more than 40 work zone accidents. In 1992, we completed the study, Highway Work Zone Safety, which contained safety recommendations to the Federal Highway Administration to address commercial motor vehicles traveling in work zones. We also issued recommendations to enhance speed compliance and traffic control within work zones following the investigation of a 1990 crash in West Virginia. The number of deaths occurring in highway work zones has been declining. Work zone crashes and fatal work zone crashes have decreased in recent years because of improvements in advanced warning technologies, better traffic control devices, lighting enhancements and improved monitoring of work zone traffic. But more work remains to be done, particularly in regards to commercial vehicles traveling within work zones and so the NTSB continues its efforts to make work zones safer. While commercial vehicles account for only 4.5 percent of all registered vehicles in the United States, they are involved in 11.2 percent of all fatal accidents and 28 percent of all fatal work zone crashes. I led an investigation of a 2014 work zone crash in Cranbury, New Jersey, involving a commercial motor vehicle (which the media dubbed “the Tracy Morgan” crash). Our investigation found that the commercial vehicle was speeding in a nighttime work zone when it encountered slow-moving traffic in advance of a lane closure. The fatigued driver failed to perceive the slowing traffic until it was too late to do anything. The commercial vehicle struck the rear of a limo van, and this impact began a chain-reaction collision involving four other vehicles. One of the limo van occupants died, and nine other people were injured in the crash. The NTSB made safety recommendations to mitigate commercial vehicle involvement in work zone crashes, calling for the implementation of traffic control strategies and devices to reduce crash events involving heavy commercial vehicles. The recommendations also addressed fatigue management programs and occupant protection improvements. Promoting collision avoidance technologies and addressing fatigue and occupant protection safety are all issues on the NTSB’s Most Wanted List of transportation safety improvements. Work zones are becoming safer because of the use of new technologies and more efficient traffic management. However, until we make more headway against the over-involvement of commercial vehicles in fatal work zone crashes, the road construction season will remain a dangerous time, requiring motorists to be especially attentive to the driving task. Pete Kotowski is a Senior Accident Investigator in the NTSB’s Office of Highway Safety. 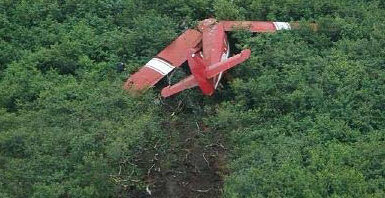 A privately hired de Havilland DHC-3T “Otter” plane impacted mountainous terrain near Aleknagik, Alaska, August 9, 2010. The pilot and four passengers were killed, including Ted Stevens, U.S. Senator from Alaska. Four other passengers were injured. The aircraft was not equipped with any electronic recording equipment, nor was it required to. NTSB investigators used information from sparse GPS position reports transmitted by satellite, engine instruments, and two surviving passengers who were seated in the rear of the aircraft to determine what happened in the accident. This limited information, however, did not reveal crucial details about the pilot’s actions (or lack of actions) in the final three minutes of the flight. The NTSB determined the probable cause of the accident to be, “the pilot’s temporary unresponsiveness for reasons that could not be established from the available information.” Ultimately, the lack of a cockpit recorder system with the ability to capture audio, images, and parametric data hampered investigators’ ability to determine exactly what happened. About two years after the NTSB concluded that investigation, an Alaska Department of Public Safety Eurocopter AS350 lost control and impacted terrain, near Talkeetna, Alaska, March 30, 2013. The pilot, an Alaska State Trooper, and a stranded snowmobiler were killed. In this case the NTSB discovered exactly what happened. The NTSB determined the probable cause was, “the pilot’s decision to continue flight under visual flight rules into deteriorating weather conditions, which resulted in the pilot’s spatial disorientation and loss of control.” Significantly, investigators determined where the pilot’s attention was directed, his interaction with the helicopter controls and systems, and the status of cockpit instruments and system indicator lights. The investigation found that the pilot reset a key instrument at an inappropriate time – known as caging the attitude indicator. With these details known, the NTSB produced an animation of the accident flight. 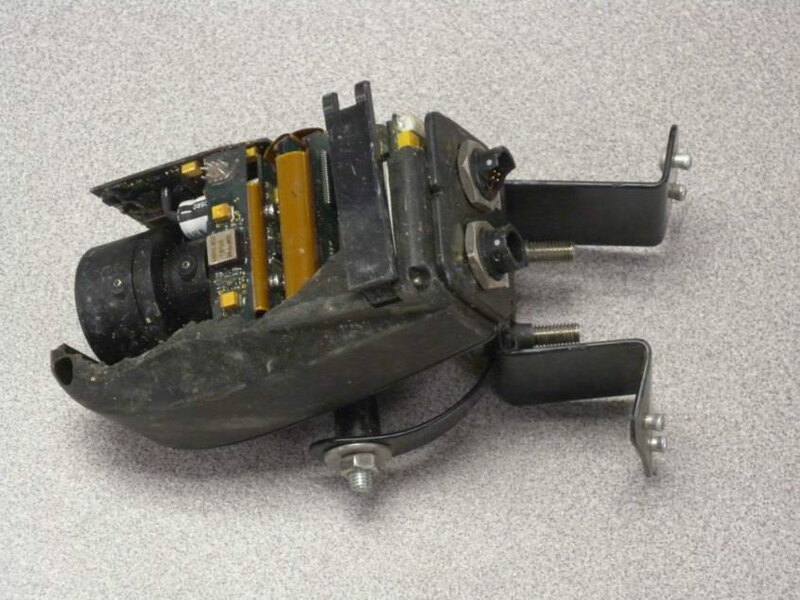 Seen here, the DPS helicopter’s Appareo Systems Vision 1000 cockpit imaging and flight data monitoring device recovered from the March 30, 2013, crash of a Eurocopter AS350. In this case, a recorder—voluntarily installed and capable of recording cockpit audio, video, and parametric flight data—made all the difference. NTSB investigators were able to determine the details of what transpired in the cockpit. Once again this year recorders are on the NTSB’s Most Wanted List of transportation safety improvements. We have been advocating for image recorders since 1999, and trying to follow the lineage of our repeated recommendations related to recorder technology is a complicated process. One of our most significant recommendations was issued to the Federal Aviation Administration in 2003—and it has yet to be implemented. Essentially, the NTSB asked the agency to require all turbine-powered, nonexperimental, nonrestricted-category aircraft manufactured prior to January 1, 2007, that are not equipped with a cockpit voice recorder, and, that are operating under Title 14, Code of Federal Regulations, Parts 91, 135, and 121, to be retrofitted with a crash-protected, image-recording system by January 1, 2007. Operators shouldn’t wait for the FAA to act. (And, thankfully, the operator of that DPS helicopter didn’t wait to be told to install recorders.) With the reduced cost of micro-electronics and reduced size of components—including cameras—operators should look into the future and equip all modes of transportation with recorders. The data collected from these devices not only can inform investigators in the tragic—and hopefully unlikely—event of a crash, but can also be used by operators themselves to make critical changes to address safety problems—ideally, before the NTSB shows up at the scene. Bill Tuccio is an aerospace engineer in the NTSB’s Vehicle Recorder Division, Office of Research & Engineering. He holds a PhD in Aviation. As an Emergency Physician, it’s been my duty to break bad news to friends and family members who have raced to the emergency department after hearing that their loved one was in a motor vehicle crash. When I start speaking, their faces reflect a mix of hope and fear, but then grim, irrevocable grief dawns with the realization that their loved one died in the crash. Although it was always there in the back of my mind, I left out the part where their loved one’s death was entirely preventable. Today marks the start of Public Health Week, when the American Public Health Association brings together communities across the nation to recognize past public health contributions and to highlight present public health challenges. There is no public health challenge more pressing than our nation’s epidemic of motor vehicle crash deaths. 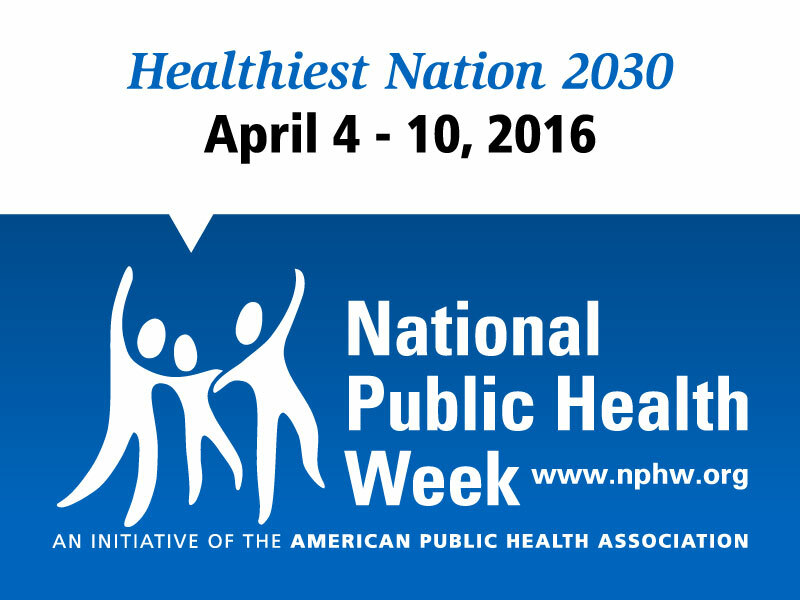 Public health is not only about disease outbreaks, contaminated drinking water, diet, exercise, or smoking cessation. It is also about preventing injuries and deaths in motor vehicle crashes, a leading cause of death for all Americans – and the leading cause of death for Americans from ages 5 to 24. More than 30,000 of us die every year because of a motor vehicle crash. According to the Centers for Disease Control and Prevention (CDC), more than 2.5 million Americans went to the emergency department —and nearly 200,000 were then hospitalized—for crash injuries in 2012. In addition to the human suffering associated with hospitalization, disability, and lost productivity, there is a significant economic impact. According to the National Highway Traffic Safety Administration, the economic cost of crash deaths and injuries in 2010 was more than $240 billion. The numbers are still being counted, but motor vehicle crashes – and the deaths and injuries resulting from them – are increasing, with an increase of more than 10 percent expected for 2015. That’s potentially 3,000 more unnecessary deaths. I think that’s unacceptable and it makes it even more critical to focus on using proven interventions. The same public health perspective that can eliminate a disease can one day eliminate our epidemic of crash deaths. Just as the solution to preventing many communicable diseases is washing your hands, there are equally simple and easy ways that you can personally prevent the epidemic of motor vehicle crash deaths and injuries. First, wear your seat belt. On every ride, in every vehicle, no matter where you are sitting. Using a seat belt is the easiest and simplest way to help prevent deaths and injuries when crashes happen. The next way you can personally prevent motor vehicle crash deaths and injuries is by preventing the accident itself. Every year, the NTSB issues its Most Wanted List of transportation safety improvements. This year’s list features many of the behaviors that cause motor vehicle crashes—distraction, impairment, and fatigue – three behaviors you control. Let me ask you a few questions. It’s all right, remember, I’m a doctor. Have you ever fought sleep while behind the wheel of an automobile? How often have you gotten behind the wheel when you’ve been drinking? Do you take cell phone calls while driving? Do you know texting while driving is dangerous but do it anyway “because you’re so good at it”? The fact is when you’re behind the wheel you need to be alert, awake, and attentive. Looking away for as little as two seconds puts you – and those around you – at risk of becoming a statistic. Don’t get behind the wheel if you’ve been drinking, no matter how much or how little. No texting and driving. Ever. If you need to take or place a call, send a Tweet, reply to a text or check an email, pull over to a safe location, stop and park your vehicle, and then hammer out those 140 characters. Advances in medicine have made diseases that killed millions a distant memory instead of a continuing reality. Treating the epidemic of crash related injuries and fatalities as the public health emergency that it is can help build a nation of safe, healthy communities. Take this doctor’s advice, and follow this prescription – the life you save may be your own. Dr.Mary Pat McKay is the NTSB Chief Medical Officer.